ADDING WATER FEATURES TO YOUR POOL AND SPA CAN CREATE AN ELEMENT OF SERENITY AND CALMNESS TO YOUR SWIMMING POOL OR SPA. Laminar jets can add a visual effect to your swimming pool and they can shoot up to 7 to 8 feet high, creating a smooth arc of water. With the help of fiber optic lights, you can create a nighttime show. The jets of stream carry the color of lights that also reflect in the pool water below. To make it more impressive, you can hide the jets in shrubs or planters and surprise your guests. There are a variety of materials you can use to hide the mechanics if you wish to do so. Sheet falls, also known as water curtains, create a smooth ridge of water falling over the pool’s edge into the water below. These waterfalls can be installed in any pool and you have a variety of shapes and sizes to choose from. There is also an extended lip that creates a more extravagant sheet fall, as well as curved models all the way from 8 inches to 8 feet. This custom water feature comes in a variety of finishes, although the new hammered metal finishes are trending now. You can polish these to maintain the new look or leave it alone to let is age gracefully. 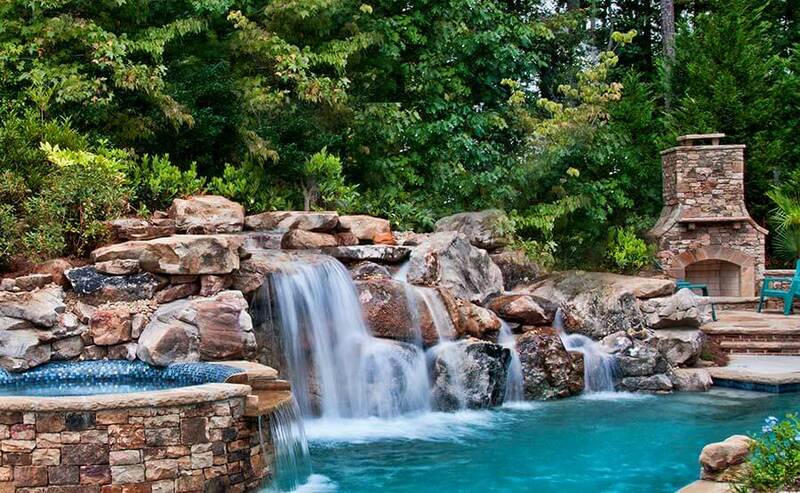 Rock waterfalls add a natural element to your swimming pool. They are adjustable so you can create a small trickle of water or a roaring river. To complete the look of your backyard oasis, you can add planters and foliage. Installing fountains in a swimming pool is fairly easy and will create a beautiful centerpiece. You are free to use your imagination when it comes to fountains because you can customize with a variety of designs, such as dolphins or mermaids. Call GEORGIA POOLS to find out more about the different water features you can employ to enhance your pool or spa.